As a teen, Steve Brown would tell his parents he would be spending spring break at a friend’s house, and head off to Colorado to climb mountains. (NOTE: this is NOT recommended behavior!) Today, when he is not in his office or training for a marathon or climb, you can still find him climbing the mountains surrounding his home in Palmer Alaska. 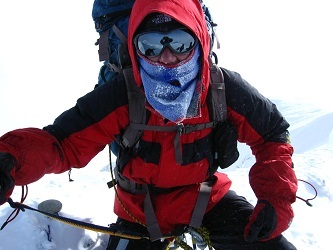 In December 2011, Steve took on Aconcagua, the highest mountain in South America (22,841 feet) and and the tallest outside of the Himalayas. The name Aconcagua comes from the Quechua words Anco (white) and Cahuac (sentinel or guard), and is translated as "The Sentinel of Stone". It is also part of the longest mountain range on the planet, the Andes, at 5,500 miles long. He carried a SPOT GPS receiver that allowed us follow him as he climbed with several updates each day. The Expedition Website provides a map of Aconcagua, Steve's location, the schedule and other information on the geography of Aconcagua, GIS and GPS. We had the chance to interview Steve before he left, so we would have a better understanding of his experience. And for the Mission of the Month (below), we explore the science and practice of mountaineering! You can follow Steve's progress up and down the mountain by tracking him, based on his lat and lon and altitude. From his site, you can check the satellite view as well as the topo map of the mountain. Friday, December 16 was Summit Day, the day the Team made it to the top of Aconcagua! Take on the challenge for yourself. Even without a mountain nearby, you can climb stairs or just get out and walk to enhance your body's ability to master a mountain. Deciding where to go is your choice. If you plan a trek in your community, look for routes safe for walking and biking. Don’t forget to check the topo map – hilly routes can take longer to bike or hike than flat routes, and thus change how far you can travel in a day or an hour. If you decide to climb a mountain or hike in a park, you will likely need to choose among the trails available, rather than plan your own route. The plant life and ecosystems in parks and on mountains can be fragile, and walking on them causes damage. Organizations who manage parks and mountains limit access to established trails. Aconcagua has two summits, the North and the South, joined by a one kilometer ridge. Climbers usually approach Aconcagua from the south. Once they reach the Plaza de Mulas base camp (4230 meters), there are three routes to the top. On Aconcagua, Steve decided to take the “Normal Route”, though he also considered the "Polish Traverse". The Normal is the fastest route, while the Polish circles more of the mountain and is considered more scenic. Which one would you take? Watch some of the videos below to help you decide. Want to experience what it is like? Here are several YouTube vidoes of various teams climbing Aconcagua that show the climbing experience in all its diversity, including the camps, weather and geology: Aconcagua Summit 2010 - Extreme 22,841ft (9:31 minutes), Aconcagua Climb January 2011 (4:33), Aconcagua summit Feb 2011 (4:06), and Aconcagua Polish Route (13:26). This hands-on activity provides an opportunity to practice packing your backpack, and enhance your understanding of how and what you pack makes a difference in how you hike and climb. What is the "Death Zone"? And is it really fatal to enter the zone? How Tall is My Mountain? How would you measure how tall a mountain really is? If you reached the top of Aconcagua, what would you do? To the Top! Climbing the World's Highest Mountain by Sydelle Kramer. For readers age 7 and up; the story of Hillary and Norgay's ascent of Mount Everest. The Top of the World: Climbing Mount Everest by Steve Jenkins. For age 3 and up; the history, geography and adventure of climbing Mount Everest. Touch the Top of the World by Erik Weihenmayer. Motivational autobiography of the only blind man to climb Mount Everest, to have climbed the world's Seven Summits. Peak by Roland Smith. For readers age 11 and up, fictional adventure of teen arrested for climbing skyscrapers who goes to live with his mountaineer father who hopes the teen will become the youngest person to climb Mount Everest.